About 3 years ago we took in an abandoned 3 week old kitten. He was adorable, white, tiny, sick, cuddly, and in need of a mama. I became his mama and we called him Gizmo. Even though we got him so young he has had this desire to be outside. It just seems to be inside of him. I wish he was an indoor all the time cat but about a year ago I gave up. He goes outside during the day and comes home to eat and rest. Last night however the younger two accidentally let him out at dusk. They tried to catch him but he was happy and gone. I went out around 10, 11, and midnight to call for him but he wasn’t coming around like he typically does. I went out to let Mindee out this morning and Gizmo was on the porch. He walked in the house and I was smelling skunk. (Keep in mind we living in a skunk path. Year round about every 6 to 8 weeks a mama and babies go through our yard to their den). So I didn’t think twice, until I stepped inside the house and the smell was stronger. Bent over and about died when I realized it was my baby Gizmo. So we went and let the puppies out we were dog sitting for the last time. And went to the store to grab tomato juice. 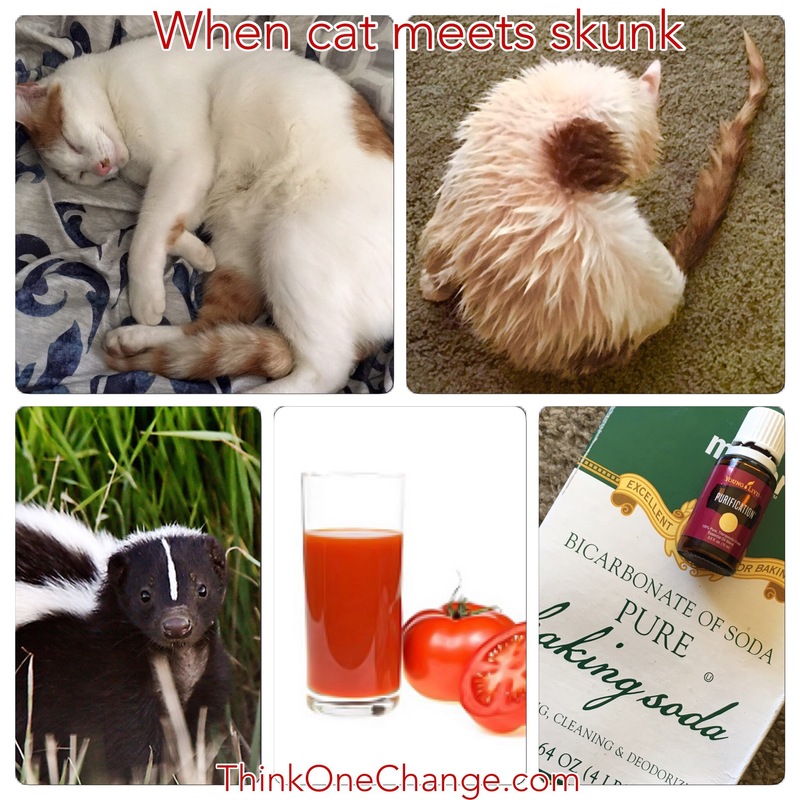 This isn’t our first run in with the skunk family but most of the time it is just the animals walking through the grass and picking up the smell. This time he was sprayed. So I mix up baking soda and Young Living Purification. (Now some people do not believe tea tree should be used on cats, I have diffused and used tea tree and purification around Gizmo since he was a baby and we have never had issues. If you are worried about it you can use lemon, lime, orange or citrus fresh). Get him wet and put the baking soda and EO mix on him, run it in and let it sit. Then after about 5 minutes add some tomato juice on him and let it sit. Rinse and repeat about three more times. Then I wash him with soap and then top one more time with baking soda and EO and rinse. My normally white kitty stays orangish for a couple days. I also mix up in a 2 oz Amber bottle vinegar, purification and citrus fresh to spritz around and spray on him. He doesn’t smell as great as he normally does after a skunk encounter but I can have him in the house. The sticky stuff is gone from him and the smell is slowly going away. I’m so thankful for my essential oils right now! Poor kitty! He is blessed to have such caring owners 🙂 I had heard about using tomato juice, using it with essential oils is of course, even better. He was pretty bad. I am very certain tomato juice alone would have done nothing for him. Thankfully he is back to smelling normal!